The flower heads are a deep brick-red on nice stiff stems. This cultivar is sometimes sold as 'Fireland'. The foliage is dark green and finely cut. The plants spread by underground rhizomes and can be mildly invasive. 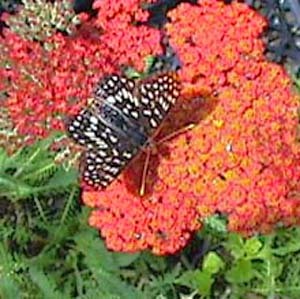 Categories: All Items, all potted plants, bee nectar plants, butterfly nectar collection, butterfly nectar plants, common names q-z, deer resistant, dried flowers, pelargonium/geranium (fancy leaf), Potted Plants, More..